It’s been way too long since I have posted a chocolate recipe. Considering that I cannot live a day in my life without chocolate. 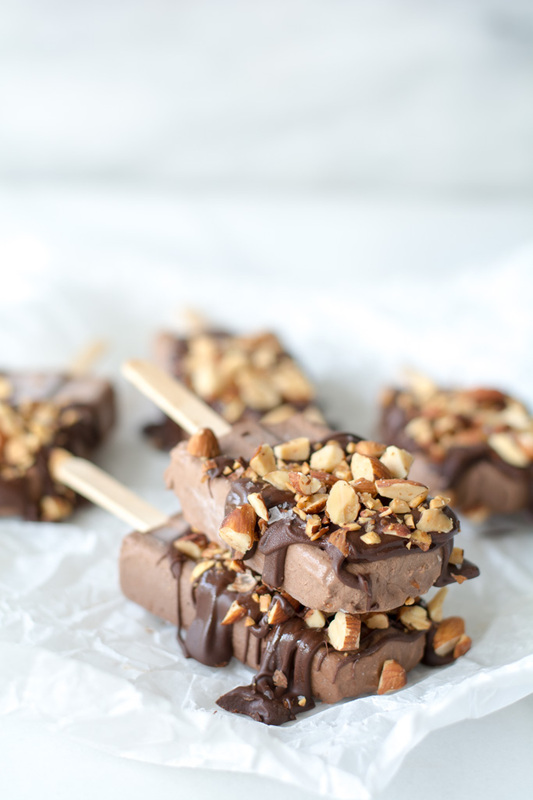 Buttered almond fudge popsicles are cooling and satisfy my chocolate sweet tooth. 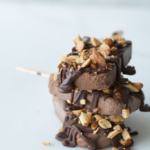 What I love about buttered almond fudge popsicles is they are dairy free, refined sugar free, and they contain two of my favorite foods…chocolate and nuts. Buttered almond fudge popsicles are smooth and creamy yet I love to have the crunch and bit of the hardened chocolate and toasted almonds. Best of all no cooking is required. 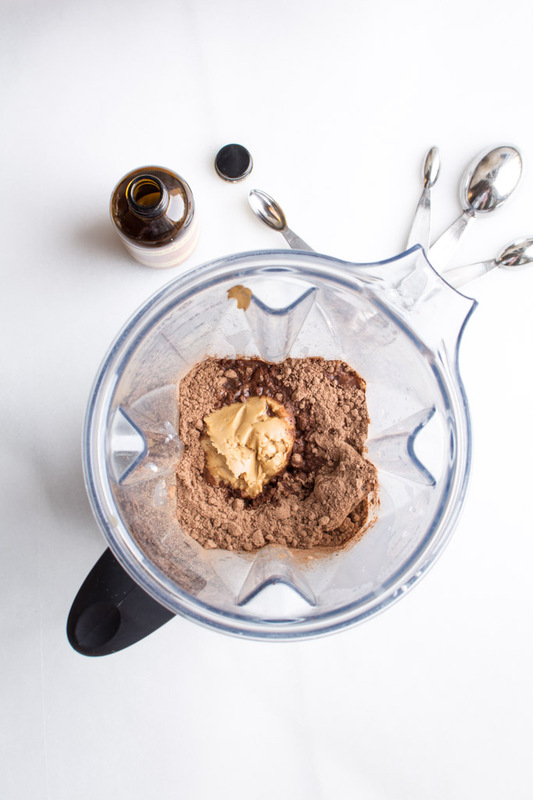 Blitz the ingredients in a blender, pour, freeze. 1) Gather the best and highest quality ingredients you can find. 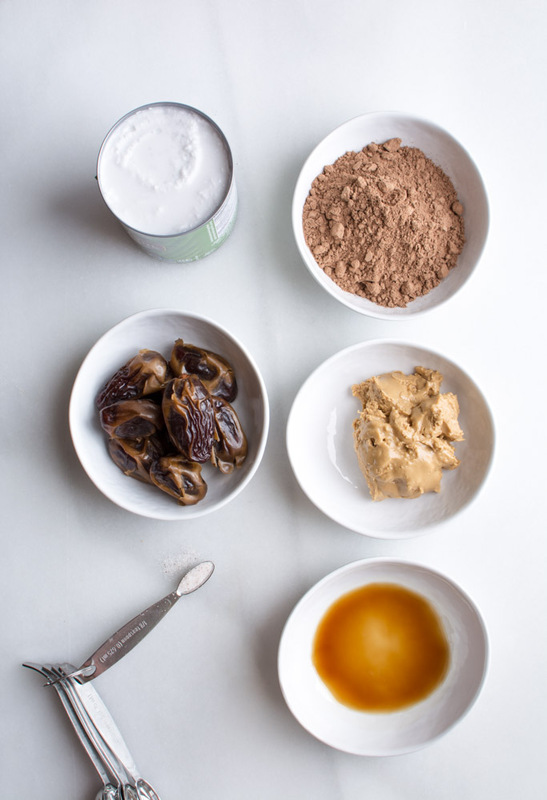 2) Blend the coconut milk, cacao, pitted dates, almond butter, vanilla, almond extract, and salt until completely smooth. 3) Pour ingredients into popsicle molds. If you don’t have popsicle molds, try using small paper cups. Place the popsicle molds into the freezer and freeze for at least 4 hours. In the meantime, prepare almonds and chocolate. 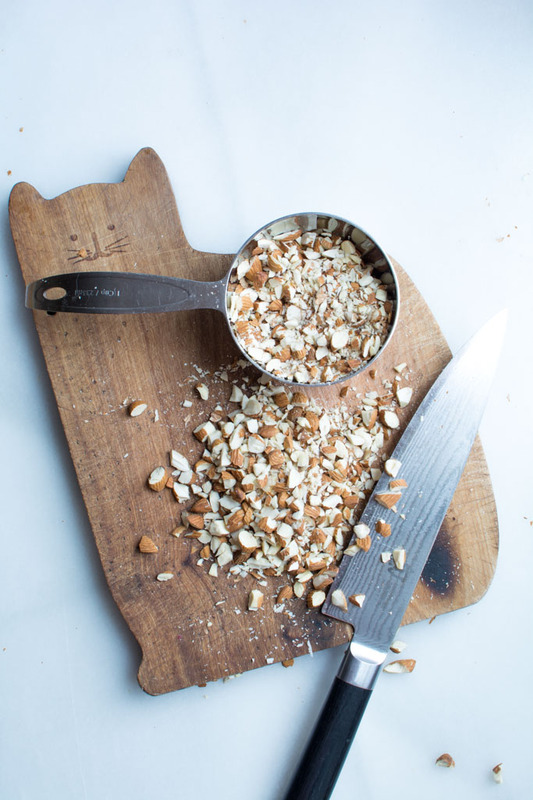 Coarsely chop almonds. In a medium size skillet, melt butter and add almonds and a pinch or two of salt. I use Redmond salt. Stir until golden. 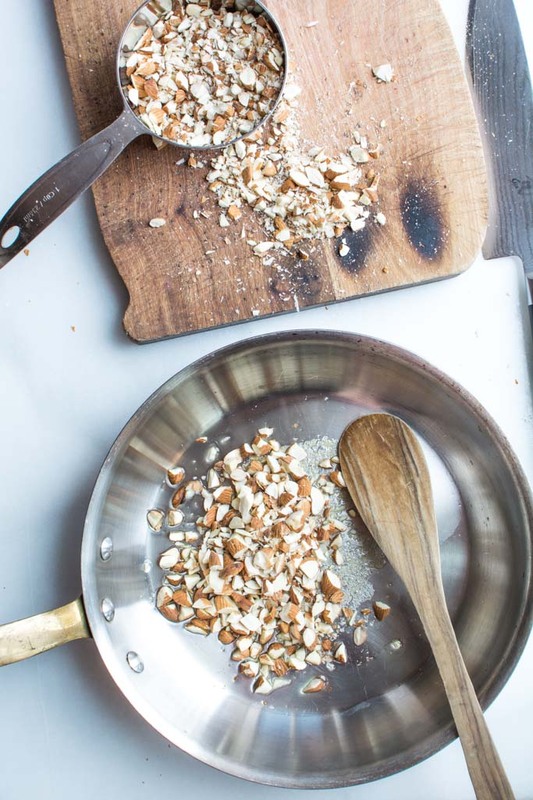 Careful not to burn the almonds. (I’ve done that more than once) . When the bars are completely frozen, prepare the chocolate. I’m using Callebaut 73% chocolate. It’s temperamental so I’m slowly melting it over barely simmering water. If using real chocolate the addition of coconut oil is not necessary. 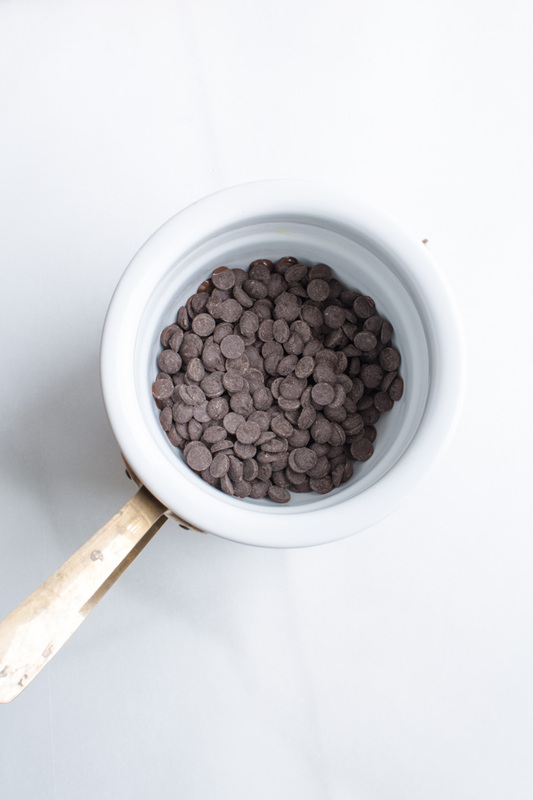 If you are using chocolate chips, then you must add the coconut oil or shortening to thin out the chocolate to make a nice drizzle. Once the chocolate is melted remove from heat and stir until the chocolate has cooled to about 85F degrees. 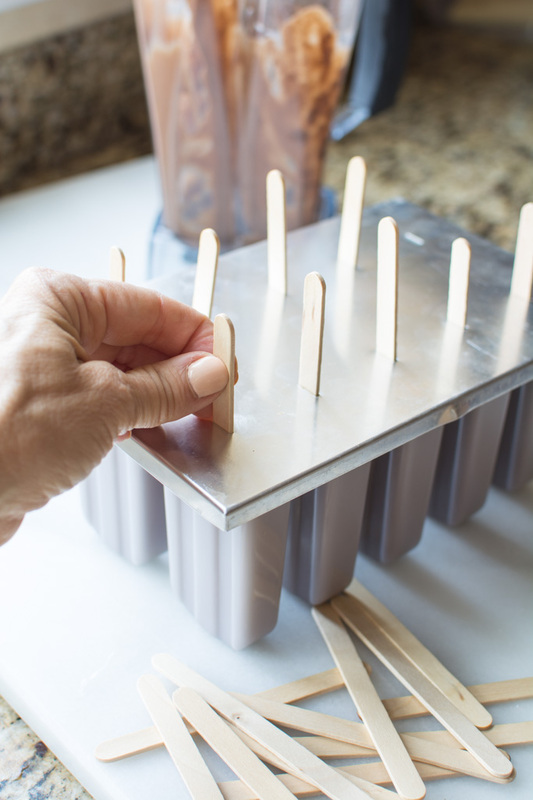 Remove popsicles from the freezer and carefully remove from the molds. Lay popsicles on a baking sheet covered with waxed paper. Drizzle with melted/tempered chocolate and sprinkle (dump) almonds over the top. Return popsicles to freezer and try not to eat them all in one day. 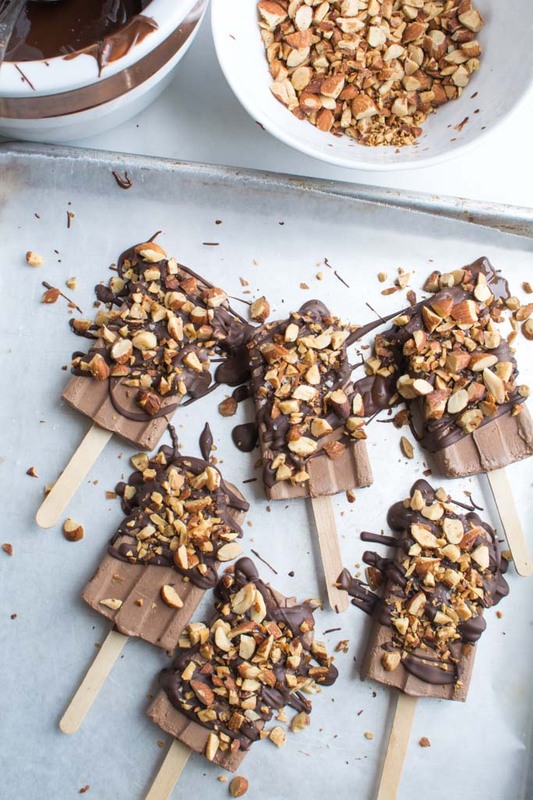 To make these luscious popsicles Vegan, omit butter and use coconut oil while toasting the almonds and make sure your chocolate is Vegan. 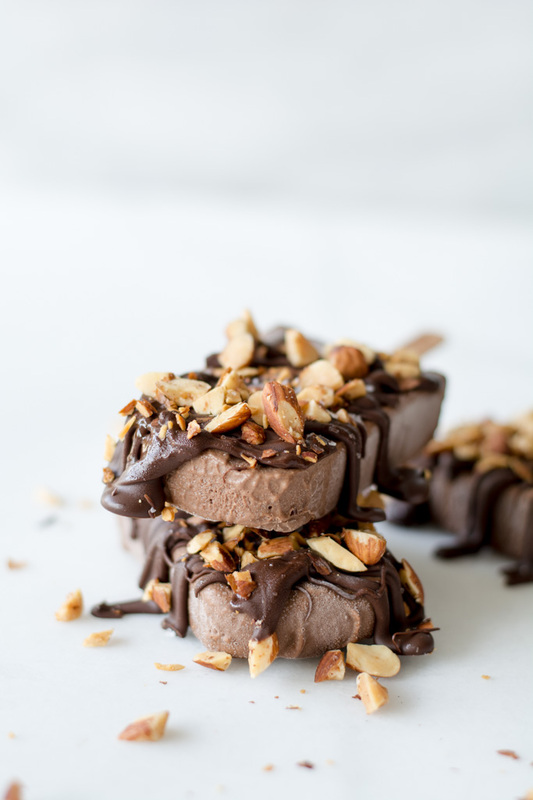 This recipe is pretty similar to my recipe for Chocolate Hazelnut Ice Cream (Vegan) but with almonds. Both are fabulous. 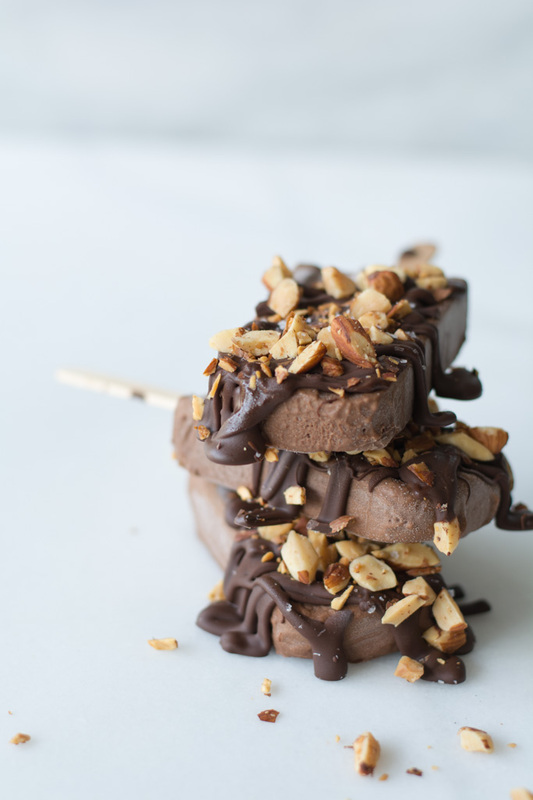 Creamy coconut milk, almond butter, raw cacao butter blended and frozen into rich popsicles. Dipped in chocolate and topped with buttered almonds. In a blender add all popsicle ingredients: coconut milk, almond butter, raw cacoa, pitted dates, salt, vanilla, and almond extract. Blend until smooth and creamy. About 1-2 minutes. Meanwhile, coarsely chop almonds. 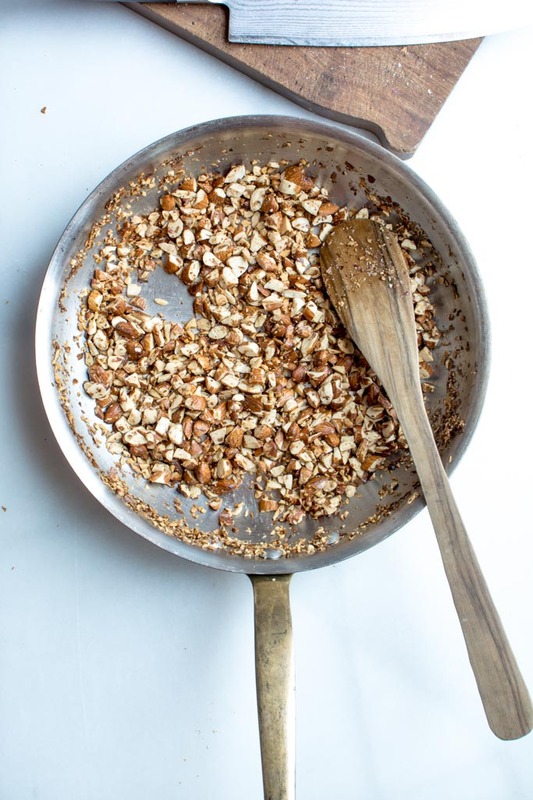 Melt butter in a medium size skillet then add almonds. Stir over medium heat until the almonds are begin to brown. Sprinkle with a pinch of salt. Remove from heat and cool completely. 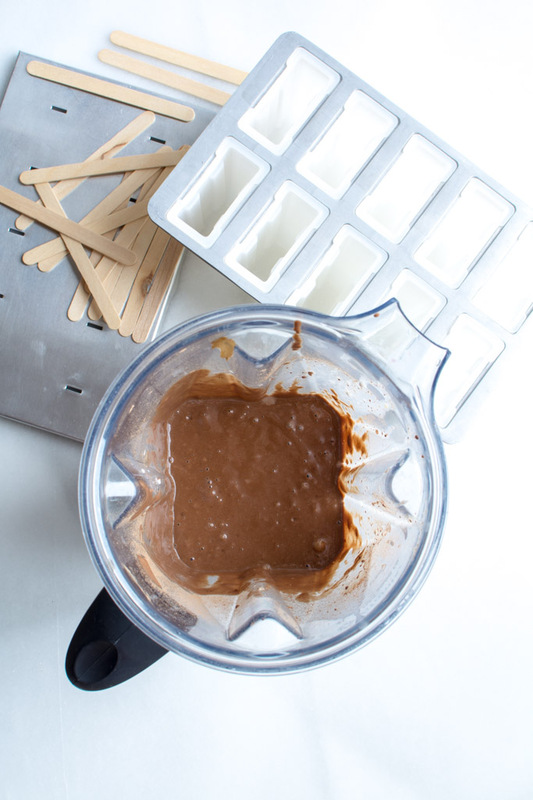 Before removing popsicles from the freezer and the molds, melt chocolate over barely simmering water. Add coconut oil and stir until smooth. If using coverture (the real stuff) chocolate, stir chocolate until cool to the touch. About 85F degrees. 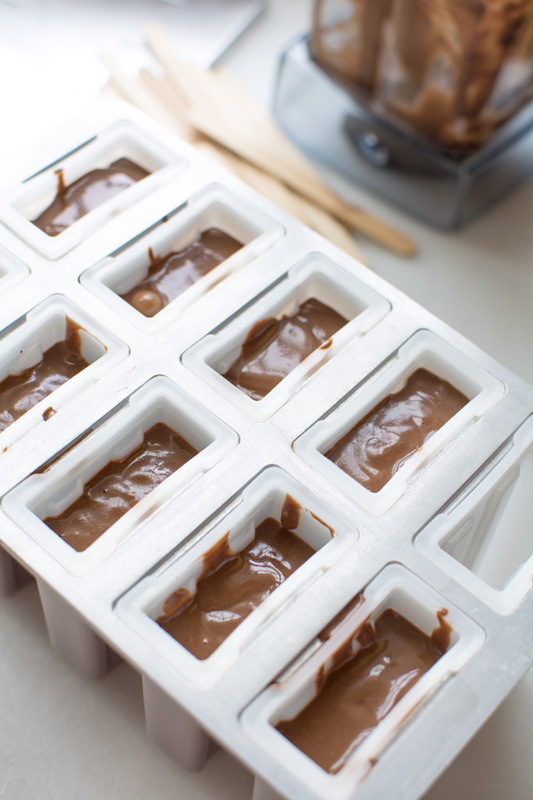 Carefully remove fudge popsicles from molds. 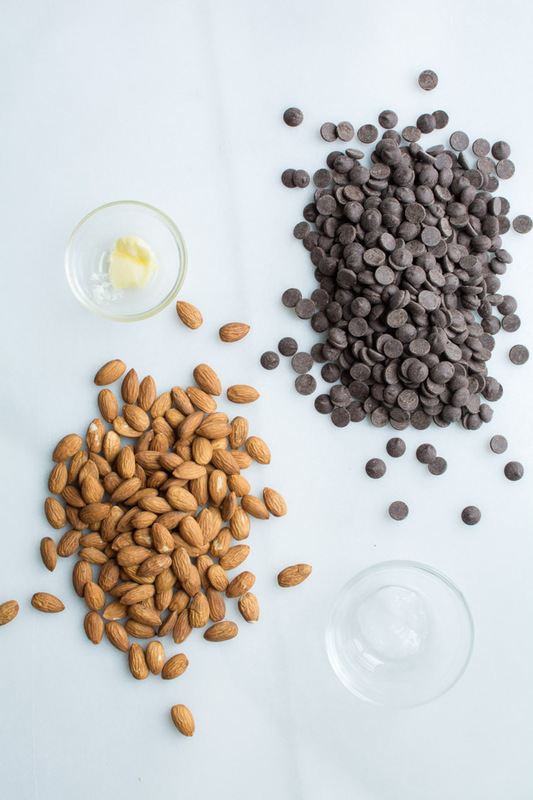 Dip into tempered chocolate and sprinkle with toasted almonds. Sprinkle with flakey sea salt, if desired. Return to freezer until completely frozen. I like using Native Forest brand coconut milk. It can be purchased from WholeFoods or Amazon. Raw Cacao can be purchased at most grocery stores. WholeFoods, Thrive market, and Amazon are good resources. I used 6 large dates. 8-10 can be used depending on sizeof dates and your personal sweetness level. I like using roasted almond butter. I love the brand "Barney" almond butter because it's amazingly smooth. Coconut milk freezes well, but the popsicles will soften if left out of freezer for a short amount of time. Popsicles are best completely frozen. 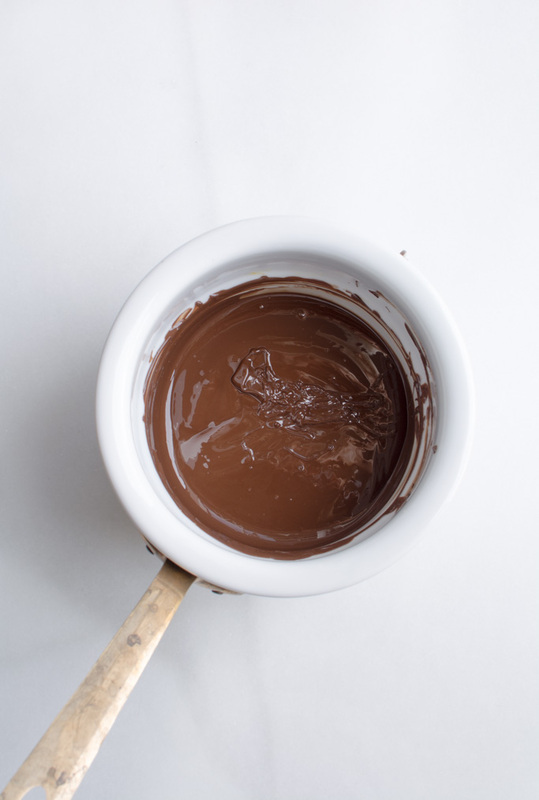 Chocolate chips can be used, but coconut oil is essential to make the melted chocolate smooth enough to drizzle or dip. Popsicles are 100% vegan if coconut oil is used in place of butter and if Vegan chocolate is used. Trader Joes carries vegan chocolate chips. If popsicle molds are not available or if you don't want to purchase some, just use small paper cups. Partially freeze the mixture before putting in a popsicle stick. After the popsicle is completely frozen, just tear away the paper cut. What do the dates do for the fudge POPSICLES? T the recipe sounds yummy but I do question that ingredient. Thus nd. The dates replace sugar in the popsicles. The dates are sweetener because unsweetened cocoa is being used.